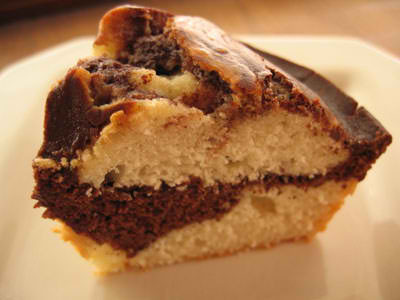 This is an easy dessert recipe for Chocolate Marble Cake, a simple sponge cake made by swirling white vanilla flavored batter and chocolate batter to create the fascinating marble effect. A light and less decadent chocolate dessert but delicious nonetheless! And what's even better is most of the ingredients might already be in your pantry: flour, butter, vanilla extract, sugar, eggs and cocoa powder! So what are you waiting for, try this easy dessert recipe now! 2. Cream the butter in a large bowl or in an electric food mixer until soft. Add the sugar and beat until the mixture is light and fluffy. 3. Whisk the eggs and vanilla extract together in a small bowl. Gradually add the eggs to the butter mixture, beating all the time. Sift in the flour and baking powder and fold in gently to mix, then add the milk and mix gently to combine. 4. Tip half of the cake mixture into another large bowl and, into this bowl, fold in the sifted cocoa powder. 5. Place the cake mixtures into the prepared tin by alternating spoonfuls of the vanilla batter with the chocolate batter, then with a skewer gently draw swirls through the cake mixture to ‘marblise’ it. Bake in the oven for 45 minutes or until a skewer inserted into the middle comes out clean. 6. Turn the cake out onto a wire rack and allow to cool before serving.Will keep for 3 days in an airtight container or freeze for up to 3 months.